Uncertain, if she ever made that exact statement. Uncertain if she ever said precisely that, either. Yet, nobody who’s ever known, worked with, or ridden with Karen Russell knows that’s just the way it is. Karen Russell’s most apparent life’s philosophies are never changing. That’s whether teaching in the classroom, coaching school athletics, training horseback riders of every level, and most of all challenging her own vast and most talented horsemanship knowledge and abilities. Proof comes from the horseshow officials today, far stretch from what she’s done and where she’s been. 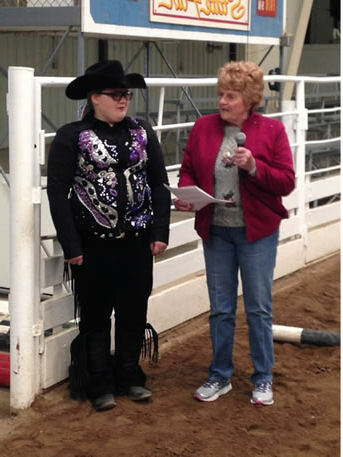 Helping others has been the life work of Karen Russell as she presents a scholarship to one of literally thousands and thousands she’s helped from the classroom to the show pen. is still horseback, competing and winning, offended mostly at herself if not the best. 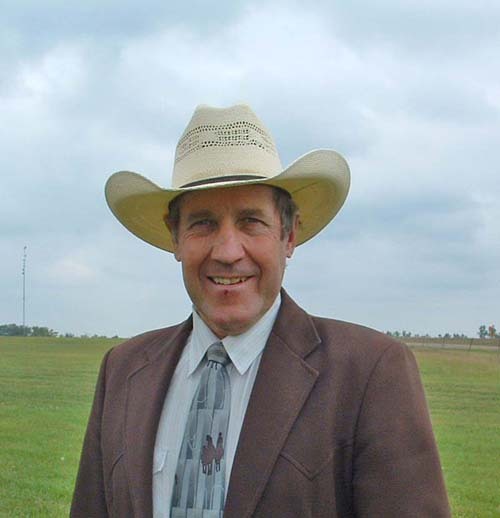 A regular at South Central Stock Horse Association (SCSHA) events, Karen Russell will be recognized during the group’s futurity show this weekend at Hutchinson, according to Steve Johnson, SCSHA president. “One thing about it, Karen’s been there and done that with horses and horse people of all calibers. Yet, Karen is still one of the most enthused competitors at our shows. Everyone admires Karen for all she’s done and continues to do,” Johnson credited. When honored by the Kansas Quarter Horse Association several years ago, Karen pointed out that she felt fortunate to combine the two passions in her life: horses and teaching. A Kansas native, Karen has been riding as long as she can remember. A photo of her at five years of age shows her astride her pony, Sarah, at Nickerson, Kansas. As an adult, Karen taught elementary and high school students for 23 years working with both regular and special education students. During most of her public education career, the ambitious woman coached all girls’ sports offered. After the final bell rang, athletes’ showers done, Karen headed to the horse barn, saddled up and continued teaching anybody and everybody, every caliber to improve their knowledge about horses. Weekends were typically spent on the horseshow circuit, with Karen competing and winning herself. Yet, most apparent was her presence at ringside and challenging critique advice to students in the ring competing. Everything had to be just right, for the horse and rider. Complete files were maintained for which judges preferred a certain style of horse, the color of outfits and whatever required being the best that day. And, if not, there were heated training sessions coming Monday when at-barn training continued. No shortage of tears as Karen has never been slack with emphasis of doing what is right, and today appreciation for that is upmost from all. Interesting side note, Karen was most emphatic with improvement for herself to help others. Barn mice tales reveal maybe even an occasional moist eye, perhaps a little cheek stream, as being personally critiqued for riding abilities by other renowned trainers and horsemen. During her career as a trainer and riding instructor, Karen has trained and shown horses in a variety of events and coached youth to numerous World Championships and year-end awards. Notably, most of the youth in the 1979 Kansas Youth World Championship team had been coached or taught by Karen at some time during their show careers. While Karen specializes in English and Western rail classes as well as horsemanship and English equitation classes, she says she really enjoys the speed events as well.
. A longtime member of both the Kansas Quarter Horse Association and the American Quarter Horse Association (AQHA), Karen is as an AQHA Professional Horseman. An approved AQHA judge, she’s traveled across the country officiating at some of the nation’s top shows. Personally, Karen has ridden and shown horses to Top Ten standings in the nation and has won or placed at the AQHA World Show in halter, hunter under saddle, western riding, trail, barrel racing, and western pleasure competitions. Amateur and youth students of Karen’s have won or placed at the World Shown, won at the Quarter Horse Congress, or placed in the Top Ten in the nation in showmanship, horsemanship, western riding, trail, hunter under saddle, hunt seat equitation, barrel racing, and pole bending. To share her vast experience helping others, Karen developed the “12 Steps To A Better Ride,” in book form, with accompanying video and cue cards. The DVD takes the rider through the 12 steps with Karen on two different horses. The horses are two different sizes, yet they are both used to accomplish the same 12 steps. Simply put, Karen Russell loves to teach, and that could possibly only be surpassed by her love to ride.